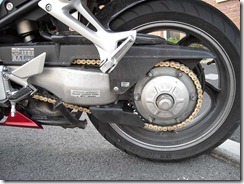 In preparation for our trip to Catalunya in a weeks time, I have today changed my chain and my front brake pads. The pads probably have 2,000 miles left on them but we will be doing more than that on our bike tour. Although I have only done 12,500 miles the chain looked in a bad way (which Rochdale Honda confirmed), it has a very bad tight spot on it. Anyway I got up nice and early today to get a good crack on with the jobs. I expected to have finished by lunch but things are never that easy are they? I ended up having 1 of those days today, when nothing goes right and everything takes far longer than it should. I broke my old chain and pulled the new DID X-ring gold chain through. I then pressed and riveted the master-link only to get a hairline crack in 1 of the master-link rivet pins, so off out to get a new link, 2nd 1 went on fine. Then I changed my front pads and realised that Hunts had given me the wrong pads (Honda changed the caliper in 2007), so I had to go all the way to Hunts to change them. Got back and fitted them both within 10 minutes. The bike is now sorted and everything is looking good for the trip.